I am a September baby. 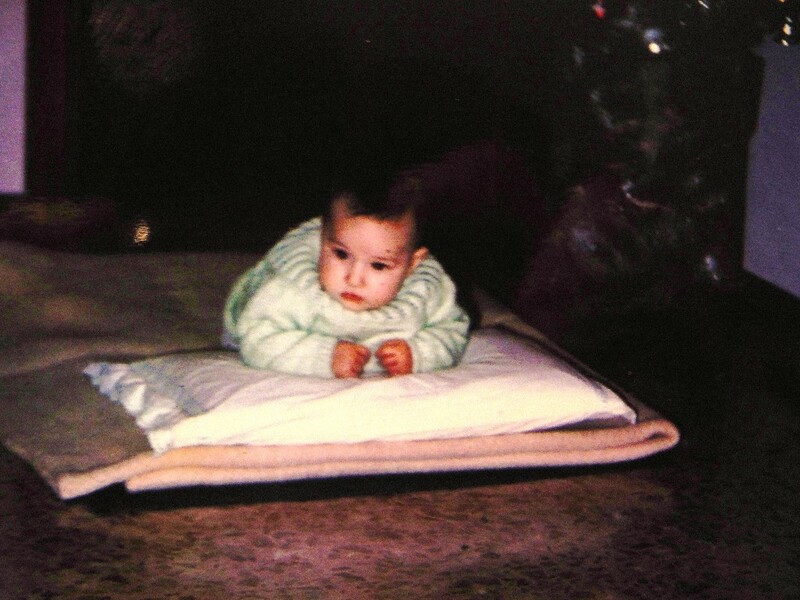 That means that, by the time my first Christmas rolled around, I was barely 3 months old. Clearly, I don’t remember a thing. Fortunately, my Dad was wise enough to take pictures. 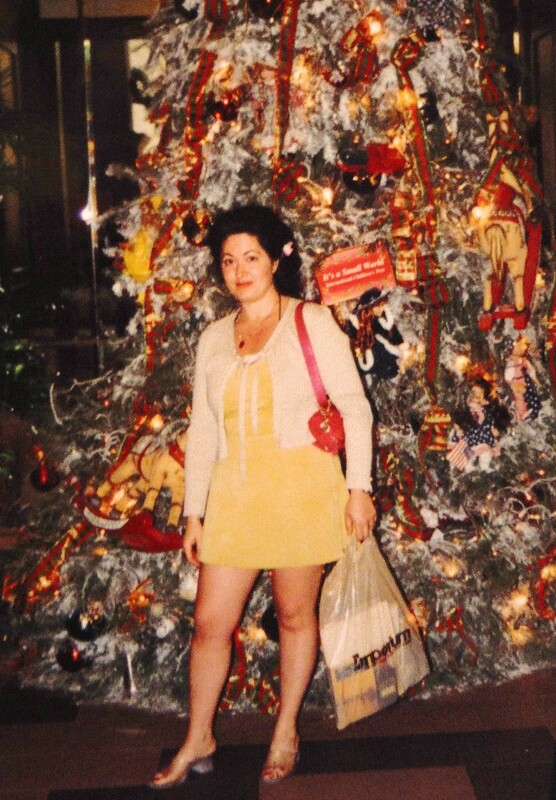 It seems to me that some ornaments we used well into my 30s were already in existence in this photo. Also, our Nativity scene has been a staple in our household. None of the figurines ever got broken, lost or mishandled. Year after year, each decoration emerged from the darkest spot in the attic, carefully wrapped. It was always a surprise, like we had never seen those pieces before. My second Christmas. Mom is pregnant with my little sister, due in February. It is 1967. Within a few years, the family expanded. 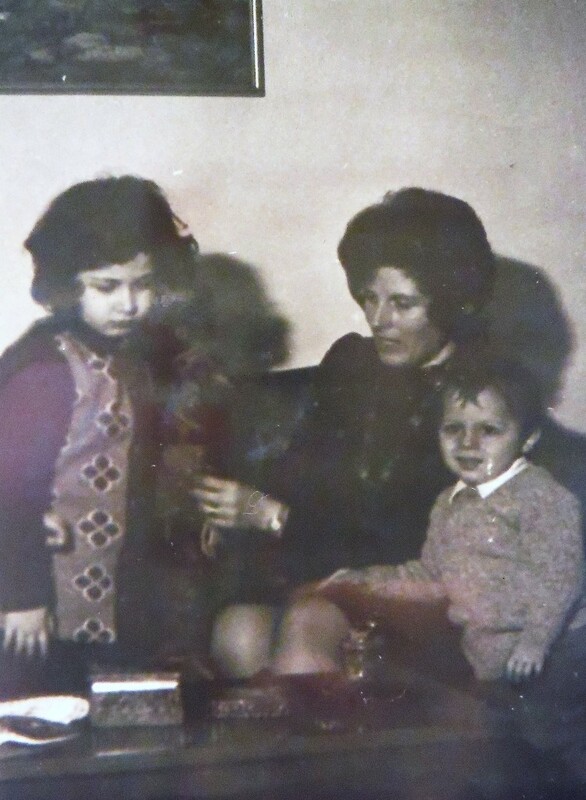 I got a sister in 1968 and shortly after a cousin, Carlo, and his little sister Chiara. 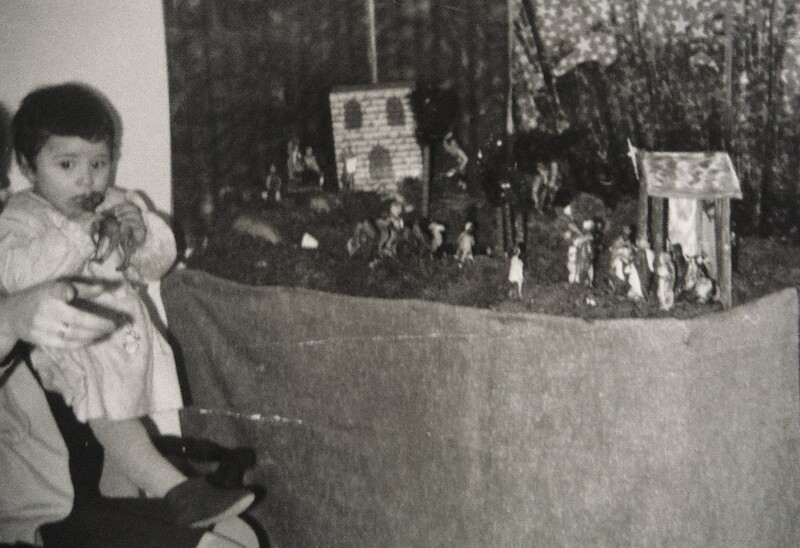 In the early ’70s, Christmas became really fun, and I was old enough to remember!! My aunt Pompilia’s house had a huge living room with textured ceramic tiles floor, fancy tapestry on the walls, paintings and ceramics. She would decorate a huge Christmas tree with lights so bright we, the kids, would be mesmerized. Then, there was the long communal table that would accommodate the family… and then some. Aunty would bring out the best of linens and starch them to perfection. She would also use the dishes she had received as a wedding gift. A grand-occasion sort of thing. The food was great, homemade Tortellini with capon broth, a roast, vegetables and of course the kids favorite: Pandoro or Panettone for dessert. After dinner it was “play time”! The sugar overload didn’t help our parents. Mom, being a teacher was always the most patient. We had a Bingo game without numbers but with animal pictures. It was our favorite. After dinner Animal Bingo. Me, Mom and my little late cousin Carlo. Those were the happiest times as a child. Then, this big night tradition faded over the years. Celebrating with a fancy dinner in Ostra, Ancona, with the late Luca and his family. When we were old enough to drive and cook, we decided to join different parties. 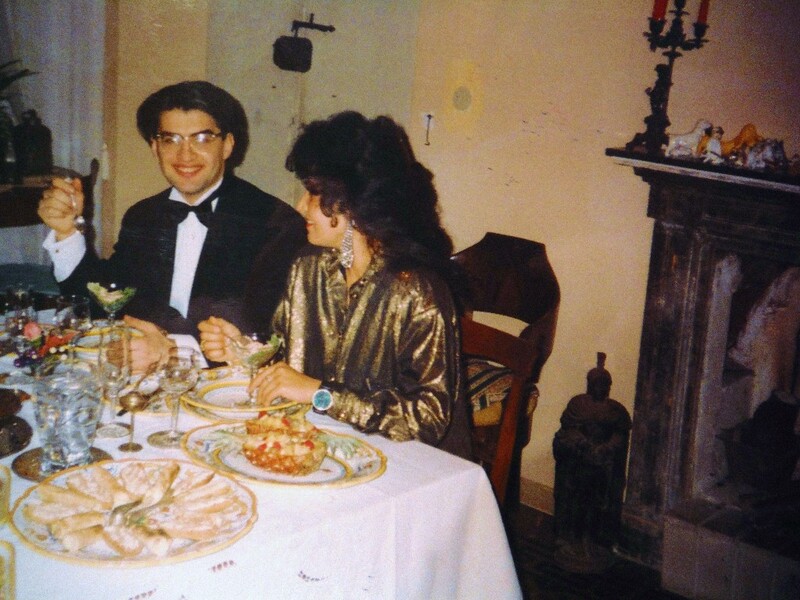 In my twenties I dated an eclectic gentleman, Luca, with a natural sense of elegance, eloquence and an innate passion for food. We didn’t know it back then, but we were “growing up foodies”. Luca’s parties, like his persona, remain unforgotten, long after his premature death at the age of 30. At Luca’s cooking was fun, but plating in antique ceramics and dressing up for dinner was even better. Then again, life seems to complete a full circle and end up the way it started. 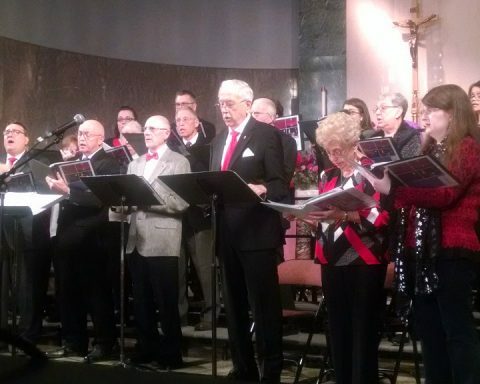 Getting “older” I longed to spend Christmas with my birth family, again. After I moved to Oregon, I tried to go “home for the holidays” as much as my finances would allow it. The same nativity set would be out and brought back to life by mom’s loving hands. Mom would also decorate our short, old, beaten up synthetic tree, and place it on the same spot every year, and “just because” we would also have a real tree in the atrium. 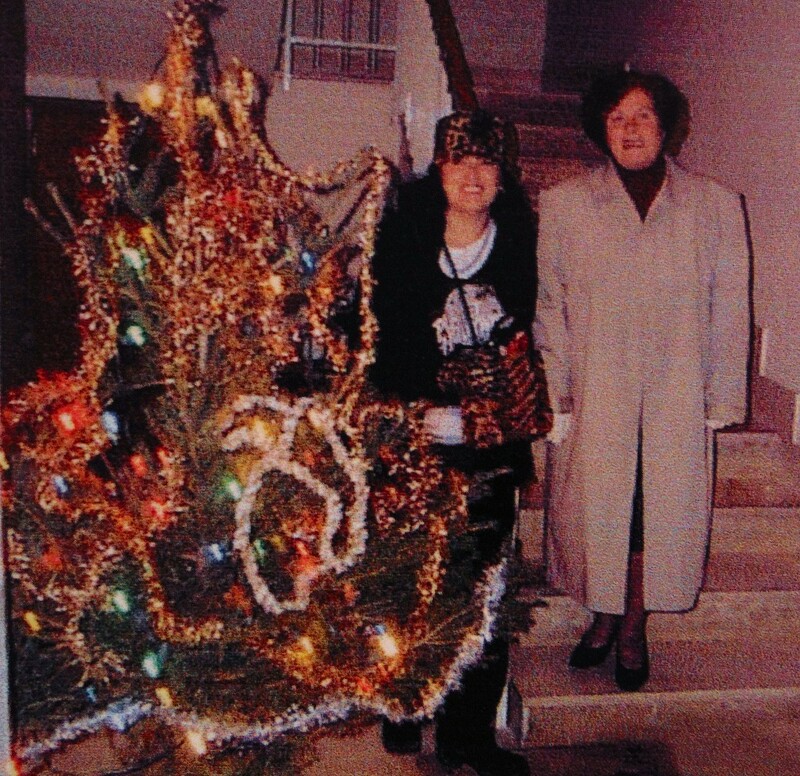 Home for the Holidays, the tree in the atrium, 1999. Ready for the new Millennium. Sometimes, my travel bug would prevail and I got to spend the Holidays abroad. Sadly, even the most exotic of places didn’t feel like real holidays, even with the most adorned tree, I would still miss my little beaten up-synthetic one. Oahu: Hilton Hawaiian Village. December 25th, 1998. Now that most of the family is gone, celebrating doesn’t seem so important, I’m happy having a quite day at home, lazy as my cat, doing what I love the most: cooking. The recipe I’m enclosing today was a winter favorite of ours. 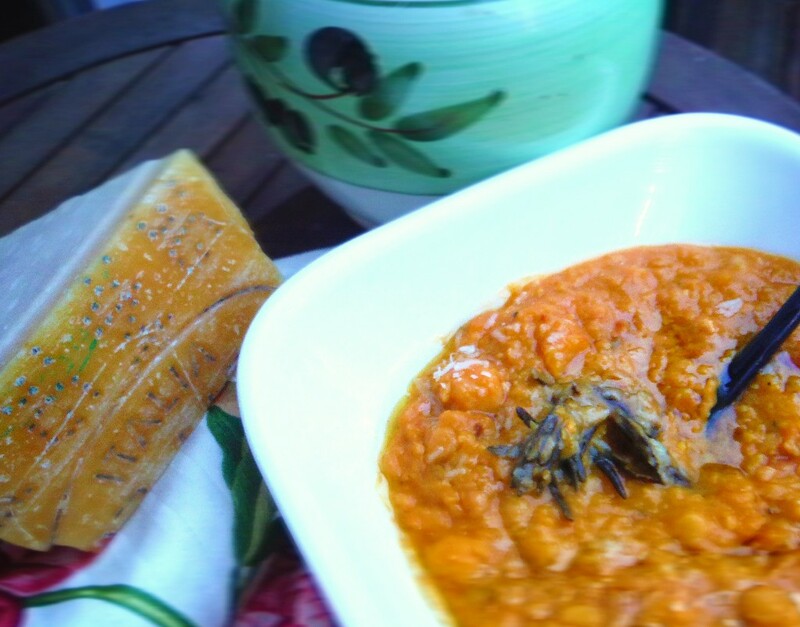 When time is of the essence, this is still one of my go-to dishes: Mom’s Zuppa di Ceci. 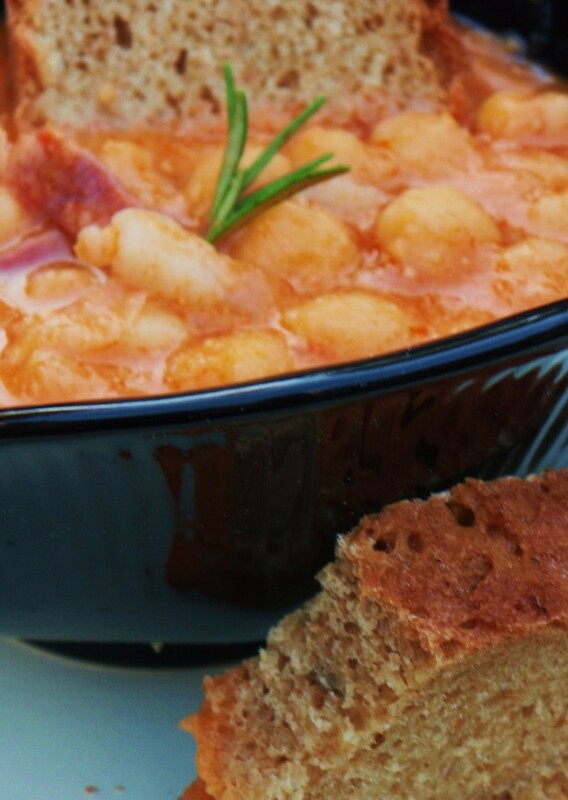 Tuscan Garbanzo beans and bacon soup. ( My mom was born and raised in Tuscany, moved to Umbria for work when she met my father) This soup is so easy to make, and even easier to love. 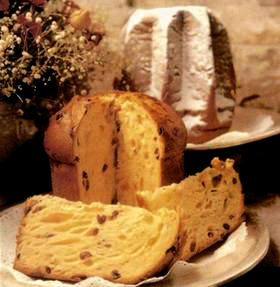 Healthy holiday comfort food, if there is such a thing. The ease of preparation doesn’t sacrifice its flavor, though. So if you have been a little “naughty” in the food department, this dish is perfect : it will help you make peace with your caloric intake gone sideways. A good hearty dish, that brings me back for a few moments to my childhood in Italy: to my days at aunt Pompilia’s living room, to the smell of the fresh Christmas tree and homemade pasta. I meet that part of me that never left it. With an immersion blender puree the beans right into their cans. Set aside. 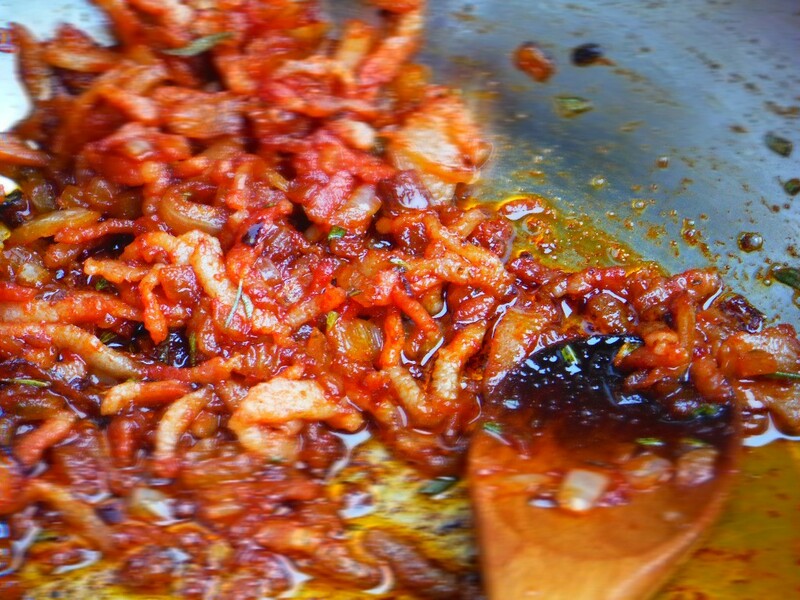 When the garlic starts to brown, add the bacon and saute’ until it starts to get crispy. Deglaze with the wine and let the wine reduce by half. 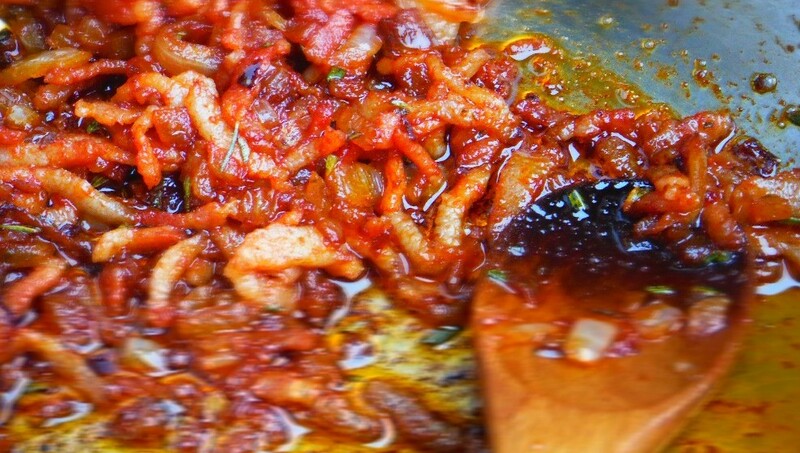 Add the tomato paste and let it cook until turns to a dark burgundy color. Now add the pureed tomatoes and fill both cans back with warm tap water, pour that too into the mix. Add the minced and sprig of rosemary. Simmer for about 30 minutes on low heat. Taste for salt and pepper. Serve drizzled with olive oil and Parmigiano cheese. Alternatively, you can add some croutons or toasted bread. Sometimes simple things can bring us so much pleasure.